A few weeks ago we started our project ‘Corporeal engagements with clay’ (funded by the British Academy) aimed at recording, visualising and replicating the figurines from Koutroulou Magoula by using a tailor-made database so as to input all their details, as well as drawing, photography, laser scanning and 3D printing. Integral part of our work is the simultaneous collaboration between different specialists in recording and visualisation techniques, since each of the methods used provide details that could not be captured by any other means. Moreover, ten selected find spots of figurines will be radiocarbon-dated. Petrographic analysis will be carried out on 50 examples, to investigate provenance, and selection and processing of raw materials. Since several figurines were found in association with hearths, thermal shock resistance analysis will be carried out, to determine the thermal properties of the clay used, and explore the hypothesis of deliberate destruction by fire. We will also study their associations with other objects and the settlement as a whole, as well as the technological choices that governed the production of figurines. In addition, we will explore the possibility of their deliberate fragmentation. Costas was born and grew up in Piraeus. He studied history and archaeology at the University of Crete, and graduated in 2007 with a First Class result. During his studies he got prizes from the State’s Scholarships Foundation and the Merchant Seamen’s Fund for his performance. He continued his studies at the University of Southampton receiving a Master of Science in Archaeological Computing (Virtual Pasts) and especially in computer based analysis of digital reconstructions as valuable tools to provide a better understanding of architecture and the built environment in the past. He graduated with a Distinction. He was recently awarded his PhD in Archaeology at the University of Southampton. 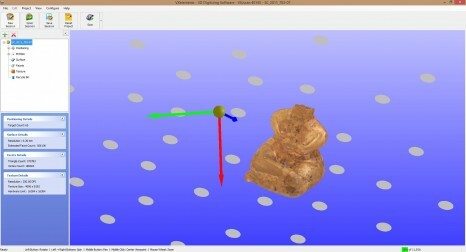 In his thesis, he employed formal and informal analytical tools and computer graphics to critically evaluate the ways that modern methodological tools and especially three-dimensional visualisations can enhance archaeological interpretations. His research interests are mainly focused on the theory of visualisation, perception and interpretation in prehistoric archaeology, as well as the processes of digital recording in archaeological fieldwork. He is keen on the relationship between people and the built environment, while he is particularly interested in the simulation of light in ancient environments as the interaction of architecture and light is usually neglected in archaeological reasoning. He has worked as a supervising archaeologist, 3D visualisation specialist and IT manager at Koutroulou Magoula Archaeology and Archaeological Ethnography Project 2010 - to date (Directors N. Kyparissi-Apostolika & Y. Hamilakis) and Zominthos Project 2008 - 2013 (Directors Y. Sakellarakis & E. Sapouna-Sakellarakis), as well as at the excavation of the Peak Sanctuary of Vrysinas 2004-2008 (Director I. Tzachili), and the surveys of Vrysinas and Thirasia (Director I. Tzachili). He founded the amateurish team ‘Modern Archaeological Documentaries’ taking part in National and International Festivals. He has presented his work at various international conferences including the Computer Applications and Quantitative Methods in Archaeology (CAA - UK Chapter and International), Virtual Reality, Archaeology and Cultural Heritage (VAST), Theoretical Archaeology Group (TAG), Visualisation in Archaeology (ViA), Cretological Congress, Electronic Visualisation and the Arts (EVA - London), European Association of Archaeologists (EAA) etc. He has organised conferences, seminars, workshops and sessions and has teaching experience at both undergraduate and postgraduate level. He has published his work in a monograph, edited volumes, conference proceedings and academic journals. His most recent edited volume is: Thinking beyond the Tool: Archaeological Computing and the Interpretive Process. He is now working on the Oxford Handbook of Light in Archaeology (Oxford University Press). He is a member of the Archaeological Computing Research Group (ACRG) of the University of Southampton, elected member of the Institute for Archaeologists (IFA) and of the European Association of Archaeologists (EAA), and member of the Program and Reviewing Committees in the International Conference of Computer Applications and Quantitative Methods in Archaeology (CAA). He is founding member of CAA Greek Chapter and has been elected at the board of the organisation as a publication officer.